I've been fighting off grandkid germs for about a week. Saturday they finally got the best of me and I spent most of the day in bed - fortunately, after we went up to Ojai for Art in the Park and the annual Massarella pottery sale. 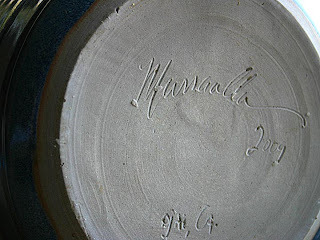 Two pots followed me home - one by Frank Massarella himself. Anybody want to guess what this is? Or what it's used for? 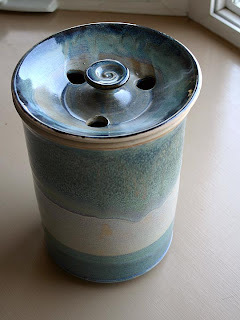 I'm planning to use it to hold spindles but it's actually a container for holding sourdough starter. Pretty and unique - how could I say 'no'? 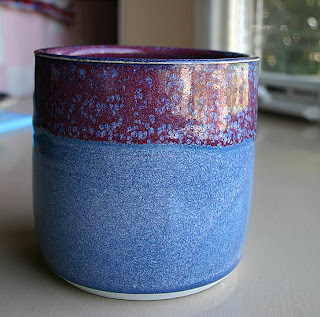 I also fell in love with this smaller blue and red pot. I had no idea what I'd use it for, but now I'm thinking it would look good sitting by my computer, holding crochet hooks. I'm currently using a coffee cup for that job and it is packed full. Something a bit bigger - and prettier - would be nice. 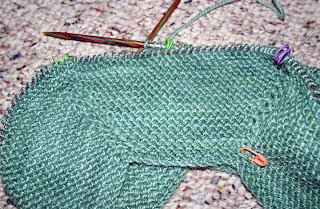 I've started a new knitting project - February Lady Sweater (Ravelry link; non-Rav link) - using Fearless Fiber mohair/wool yarn in Verdure. The second buttonhole had me stumped for a few days, but tonight I found a YouTube video that showed a slightly different method and I'm back in action. The next class is a week from today and I need to have another 3" and the third buttonhole completed by then. I also picked up a new-to-me knitting bag to hold my latest project. 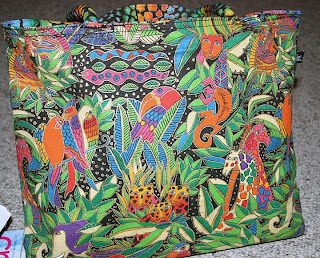 This Laurel Burch bag showed up at the Guild's recycle day event and I had to have it. 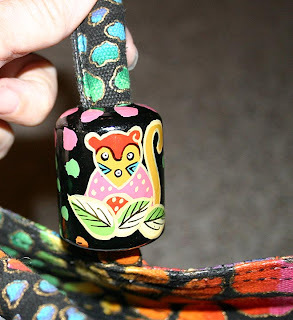 Just looking at it - complete with its hand-painted bead on the handle - makes me smile.